Chief Minister of Uttar Pradesh Akhilesh Yadav inaugurated Akshaya Patra's kitchen in Lucknow on 15th March, 2015. The other dignitaries present for the grand opening of Akshaya Patra's second kitchen in the state were Ram Govind Chaudhary, Minister for Basic Education and representatives of the Caterpillar Foundation, the principal investor in the kitchen. Akhilesh Yadav also took the opportunity to tour the state-of-the-art centralised kitchen where he observed the operations underway. He commended the Foundation on the work it does, and wished Akshaya Patra success in all its future endeavours too. The Lucknow kitchen has been constructed over two acres of land allotted to Akshaya Patra by the State Government. The kitchen will be able to produce food in huge quantities, up to 60,000 rotis, 10,000 litres of dal and 7 tonnes of cooked rice in just two hours. Currently the kitchen will serve 11,800 students across 109 Government schools in the region. In the coming months Akshaya Patra intends for the kitchen to expand its reach to 100,000 children across 690 schools in the region. Thanking Akhilesh Yadav on the occasion of the inauguration, Chanchalapathi Dasa, Vice Chairman of Akshaya Patra said, "I am grateful to the Honourable Chief Minister, Sri Akhilesh Yadav for his unflinching support through the years. With his continued encouragement, we are confident that we can reach out to more children and serve them with nutritious mid-day meals on every school day." 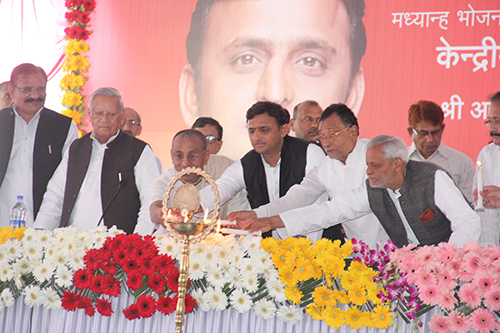 To watch the speech by Chief Minister Akhilesh Yadav during the event click here. Make a contribution to The Akshaya Patra Foundation.